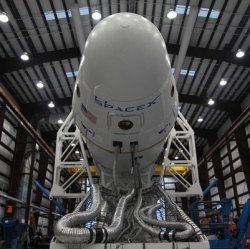 When SpaceX’s Dragon capsule successfully splashed down into the warm embrace of the Pacific ocean a few months ago, it meant that commercial spaceflight had finally arrived and was here to stay. We covered the mission from start to finish, but a new video from SpaceX itself (with lots of unique footage from launch to landing) is definitely worth a few minutes of your time. The mission was an unqualified success, of course, and it was carried live on NASATV, but SpaceX (being justifiably pumped about what it’s accomplished) has put together this little montage on its own. The best part (you know, besides all the space stuff) is seeing the SpaceX employees react to what they’ve just accomplished: we can only imagine what being part of such a team and such an event would feel like. Watch the video below.